Retired Chief Armand La Barge was the Master of Ceremonies. A big cake was cut as part of the Canada 150 celebrations. In his very touching and inspiring speech, Hon. 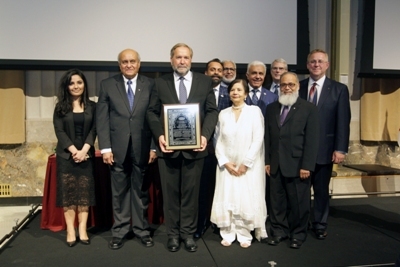 Thomas Mulcair spoke about human rights and the discrimination based on religion faced by Muslims in Canada and south of the border. Many Members of Parliament attended. Member of Parliament, John McKay brought greetings from the Government as Prime Minister Justin Trudeau was again in New York at the United Nations. Hon. 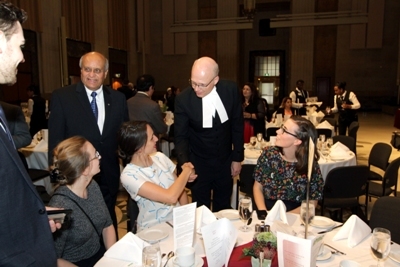 Geoff Regan, Speaker of the House of Commons also attended. 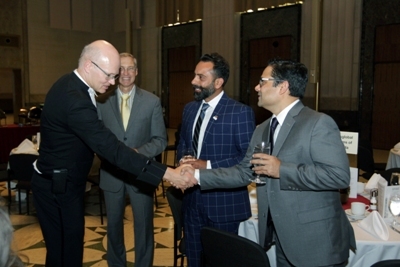 Mayor Jim Watson who has been at many of our past celebrations and is supporting the Iftar dinners at the Ottawa City Hall, was in Seattle and could not attend this year. 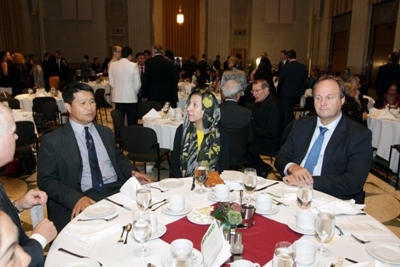 Ambassadors of Indonesia, Thailand and Turkey attended with their wives. 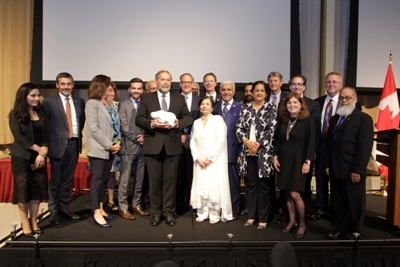 High Commissioners for Brunei Darussalam, Pakistan, Sri Lanka, New Zealand, Ambassador for Afghanistan, Charge d' Affaires for the United States, Azerbaijan and Germany attended as well as several other Senior Diplomats from United Arab Emirates, Malaysia and the United States of America. His Excellency Luigi Bonazzi, Apostolic Nuncio, Ambassador of Holy Sea (Vatican) said Grace before dinner. Sandulak's polar bear and a plaque were presented to Hon. Thomas Mulcair. 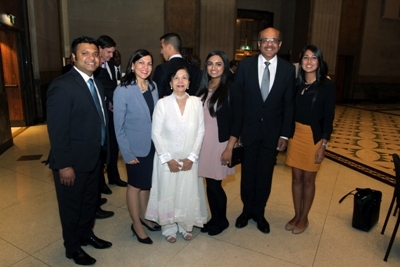 Like many people of different faiths who have come to learn about Eid-ul-Adha through their friends, communities and places of work; I understand this celebration to be one about a willingness to make sacrifices in our lives to commemorate and remember past trials and what it taught us and about charity and giving to those in need. I’ll speak of one community that I know very well; the RBC community. It is one that I have been a part of for three decades and it is with sincere pride that I say we were selected once again this year as one of Canada's "Best Diversity Employers" by Mediacorp Canada Inc. in its annual survey of Canadian businesses. It’s easy, in a country like Canada, to take diversity for granted. In so many ways, it’s like the air we breathe. However, recent events south of the border, around the world and even right here in Canada, have reminded us of the responsibility we each have—to ourselves and to the world—to show that inclusivity is a strength that can not only defeat intolerance, radicalism and hate but it also supports greater creativity, employee engagement, innovation and overall performance in the workplace and in society. Our approach to fostering inclusion is through being mindful and accommodating of diverse needs such as prayer times, dietary restrictions and time accommodation for celebrations. It’s about being able to bring your true and authentic self at work so unique perspectives be can encouraged. I know this is critical to our ongoing success at RBC. 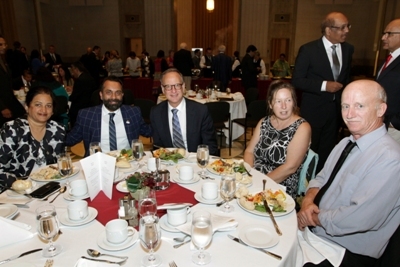 And speaking of success, we’re proud to support the Association of Progressive Muslims of Canada because of their amazing work in celebrating diversity, fostering inclusion, building bridges between communities, and supporting Muslims of all backgrounds. Thank you for this honour to celebrate with each of you tonight, Salam! As in the past, many drove from Toronto to attend these celebrations. 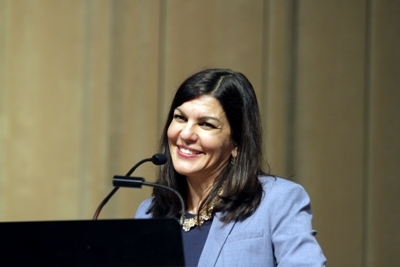 For Keynote Address, please click here. TD Bank, Platinum table sponsor, sent Interns from the Hill. Hon. Geoff Regan was pleased to see them here. Hon. 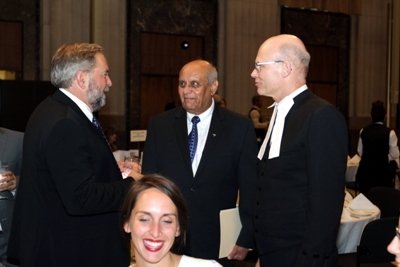 Thomas Mulcair, Mobeen Khaja and Hon. Geoff Regan. 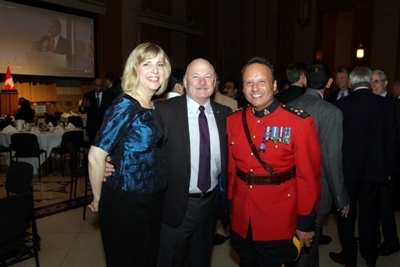 Charge d'Affaires of USA, Elizabeth Aubin, Daniel Aubin and James Malizia, Asst. 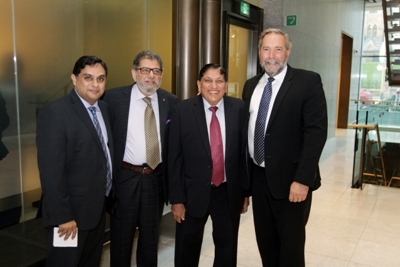 Commissioner RCMP Salim Fakirani, Bahadur Fakirani and Sultan Fakirani with Hon. Thomas Mulcair. 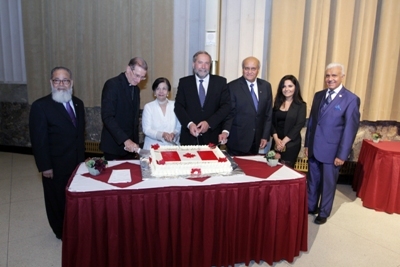 Salma Zahid, M.P., Imran Hasan, Rob Oliphant, M.P., Susan. McCord and Phil McCord L - R: Aslam Zubair, Tina Sarellas, Anees Khaja, Anika Reza, Bashir Surani and guest.